Boi-girl is a repeat offender - she has often chosen books over men, parties or even, ahem, work. With a boi (book) in hand and a cup of cha beside her, she can be spotted somewhere in the south of the country, though her heart lives in two other cities - Delhi and Kolkata. 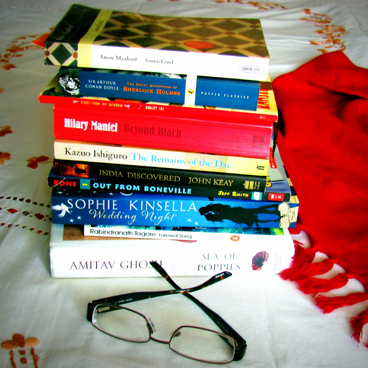 In this column she thinks aloud on books and her experiences with reading. Join her here for more boi-er adda. The afternoon was hot, muggy. The fan was rotating sullenly. As sullen as I felt for I had been dragged to bed by the mother for what I considered a completely pointless afternoon nap. Which five year old bothered with such things? But I was a scrawny thing, prone to fevers and stomach aches and the mother was having none of my protests. I lay down by her side and she read her book for a while. Then, as I listened carefully, her breathing grew heavy and deep. There, she was off into dreamland, and I was now free to explore. I waited a few good extra seconds just to be sure. I wasn’t being disobedient just because I wanted to. In fact, I had a very important task at hand. I slipped out of bed, retrieved the copy of Abol Tabol where I had left it in the other room and proceeded to the back veranda. The back yard had recently become the home to a tabby cat and I had a deep suspicion. I flipped the pages to where ‘Haw Jaw Baw Raw Law’ started. I stared at the illustration of the cat, winking, clever, mean, and to my mind, clearly up to no good. Till today, I am sure there was some deep conspiratorial relation between the cat in the back yard and the one Sukumar Ray drew to go with his story. And there, perhaps, lies the best measure of success for an illustrator and writer. He was able to not only tell an utterly delightful and nonsensical story, but the pictures he drew became the template by which a child reading the story years later viewed all creatures who landed up mysteriously unannounced at the doorstep. And indeed, what gorgeous versions have been created even when someone other than the writer has been the illustrator. Blake’s visualization of Willy Wonka, or Matilda, or The Enormous Crocodile, have brought to life some of the best writing for children. Millions of children have imagined just how the crocodile looked when it set off to catch its prey, or what Willy Wonka’s chocolate factory was like and just how gross the Twits were with their unwashed faces and beard. The other day, I picked up a book by another modern genius, Neil Gaiman. The book, Fortunately, the Milk, is the hilarious story of a father’s improbable adventures when he sets out to buy milk to go with the breakfast cereal. While his son and daughter wait at home, he is kidnapped by aliens, lands up with a time-travelling dinosaur, has a run-in with some ‘wumpires’ and does something interesting with the space-time continuum which allows him to get back home, a little late, but with the carton of milk unscathed in his hands. Of course his children view his story with healthy disbelief. As I turned the pages of this delightful book its rich black and white illustrations drew me in further and further into the story. Playful and intricate, richly imagined yet with a lightness of touch, this was that perfectly illustrated book where neither the words nor the pictures dominate over the other. It’s as though both came out smoothly and in perfect concert with each other, tripped off to the press and ended up in the pages of the book that I now held in my hand. Of course, I know that is not how it is. A little book like this would have involved a whole lot of planning and thinking from the author, the artist, and the publishing house. Each character would have been carefully worked out and each situation studied in detail so that the eagle eyes of children reading the story could find every element described and more. The production of the book—from the paper to the page size to the cover and the binding—would have been discussed threadbare. And so a perfect little creation was born that combined fun and creativity. This is a book I read myself with joy, shared with my child, and will read to younger kids knowing they will go back to it again and again. “ম্যাও!” কি আপদ! রুমালটা ম্যাও করে কেন? চেয়ে দেখি রুমালটা তো আর রুমাল নেই, দিব্যি মোটা-সোটা লাল টক্‌টকে একটা বেড়াল গোঁফ ফুলিয়ে প্যাটপ্যাট করে আমার দিকে তাকিয়ে আছে! …Next to me on the grass was my handkerchief. Just as I was about to pick it up to wipe my face, it went ‘Miaow!’ How utterly weird! Why on earth would my hanky say ‘Miaow’? If I were in the Nobel / Booker / .......... Literary Committee, I would have voted in favour The 1st few paras - where was this? Kolkata 230 ...... ? I adored the 2 jewel kids - proud being their Father. I am still so. With years everything changes - what has not changed - are - brilliance of the Boi Girl - Quiet Pride of being a devoted worker, mother, wife - all packaged into 1. Perhaps all fathers think so about their off springs - I am proud to be one. About the qualitative assessment of the posting, I am probably least qualified. However, I join the followers of this website - who ever is driving it & salute him / her.